We cover Southwold, Halesworth, Beccles and Bungay and all the villages in between. Our strong team of leaders give all the girls opportunities they may not get in other organisations, whether that’s trying a new craft or going on holiday as part of a unit. 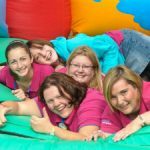 As a Division we join for annual activity days and special events, bi-annual Guide and Brownie holidays and various camps. Southwold boasts the oldest Guide unit in Suffolk, opening its doors to girls for the first time in 1910. Many other units have also been opened and welcomed many girls over the last 100 years. We continue to open our many doors to girls, offering fun and friendship while moving with the times! Girls (and helpers!) are welcome to join us – each unit has their own web page so check out what we are up to – if you fancy it drop us a line, contact details are on each unit page.